The Scaly Ground-Roller is endemic to Madagascar where it frequents subtropical and tropical moist lowland forests in eastern Madagascar. This shy bird is usually seen alone running along the ground and stopping regularly to catch a prey. Its cryptic plumage makes it difficult to find in the dense vegetation of the dark forests. 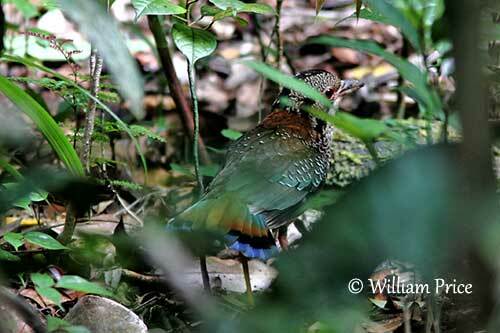 The Scaly Ground-Roller is threatened by deforestation and hunting for food. The species is currently listed as Vulnerable. The Scaly Ground-Roller adult is a plump, long-legged ground-roller with rufous, green and blue plumage pattern and fine scaly markings. On the upperparts, we can see a rufous hind collar. Scapulars, tertials and wing-coverts are bronzy-green with conspicuous white, crescent-shaped markings outlined in black. Primaries and secondaries are dark brown with buffy-white wingbar visible in flight. The uppertail is rufous with bronzy green base. The outer rectrices show dark, subterminal band and blue tip, whereas the two central pairs are bronzy green. The underparts are buffy-white with dark scaling effect. Belly and vent are buffier with less prominent scaled markings. 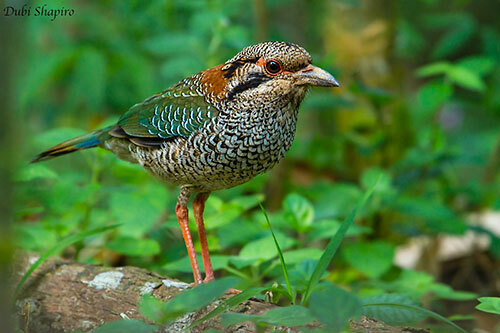 The Scaly Ground-Roller is found in E Madagascar, from Marojejy in N to Andohahela in S.
The Scaly Ground-Roller frequents the lowland evergreen humid forest and especially undisturbed areas where it can find dark undergrowth and thick leaf litter. It can be seen from sea-level up to 1,000 metres of elevation along the eastern escarpment. The Scaly Ground-Roller’s call is a short, muffled « ko-uh » given while foraging. The alarm call is a hissing “kwish-sh” that decreases in volume. During the breeding season, it gives series of soft, hollow “whoo-oop” or more modulated “mow ooop” repeated at intervals of 5-30 seconds. These calls are used to advertise the territory and are given from perch, often low, horizontal branches, around dawn and in late afternoon. The vocal communication is used to define the territory, but also to maintain contact within the forest. The contact calls are given by both mates and by family members. The Scaly Ground-Roller feeds on invertebrates such as earthworms and various insects (ants, beetles, caterpillars, and crickets), snails and spiders. It also takes small vertebrates including frogs, chameleons (Brookesia), lizards and rarely small mammals. It forages mainly on the ground, running along the forest floor, stopping regularly, listening and watching while searching for prey and rummaging through the deep leaf litter with the bill. It may hawk flying prey while performing short-distance flights. It is usually seen alone or occasionally in pairs. 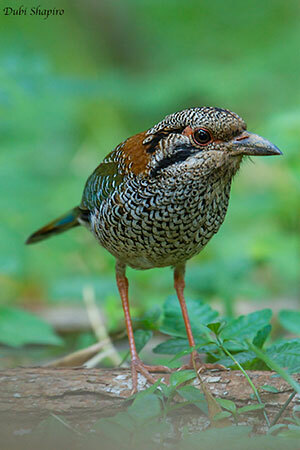 During the breeding season, the Scaly Ground-Roller defends the territory and gives advertising calls. Courtship-feeding by male to female is common during the courtship period. They are socially monogamous. The nest is an excavated burrow with a nest chamber at the end. The burrow is excavated in steep earth bank with overhanging vegetation. The Scaly Ground-Roller is mainly sedentary, but it may move within its range depending on weather conditions. This species has mainly terrestrial lifestyle and is not able to sustain long-distance flights due to its short wings. It only flies over short distances. The breeding season takes place between September and January, with the laying mid-October/early November in one study. The nest site is usually near stream in valley, in area with tall herb cover. The Scaly Ground-Roller excavates a burrow with a nest chamber at the end. The burrow is 50/100cm long with a diameter of 6,5/10 cm. the nest chamber (20 cm wide/15 cm high) is lined with dead leaves and earthy pellets. They usually nest in the same area every year, with the new nest very close to the former one. The head is like the underparts. We can see three irregular black bands on central crown, behind the eye and below the eye, through the ear-coverts. The stout bill is dull blackish-brown. The nostrils are placed near the base of the upper mandible and are covered by rictal bristles. The eyes are brown, surrounded by bare, pinkish-orange eyering extending behind the eye where it forms a patch of the same colour. Long legs and feet are pink-orange with whitish claws. Male and female have similar plumage, but she is slightly smaller than male. The juvenile has more rufous on crown, nape, breast and flanks. The black stripes on neck sides are visible and both flight and tail feathers show the same pattern as in adults. However, the wing-covert pattern is much less conspicuous than on adults. The female lays a single whitish egg (occasionally two) and incubates alone while the male feeds her during this period. She incubates during at least 18 days, but probably more. Both adults feed the chick that reaches the tunnel entrance to receive the food. The young fledges 24 days after hatching, and remains with the female for the first week. It appears to become independent at two months old. Once the chick leaves the nest, the adults hide the nest entrance with dead leaves and sticks. 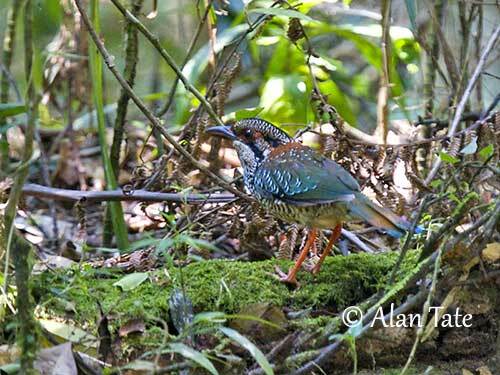 The Scaly Ground-Roller has restricted range in E Madagascar where it is uncommon. It occurs in several protected areas but it is threatened by rapid habitat destruction through clearance and degradation of lowland rainforest for agriculture expansion. However, the species was recently observed in cleared areas and second growth, indicating some adaptation to other habitat types. It is also hunted for food. The population is estimated to number 1,500/7,000 mature individuals and is declining due to the previous threats. The Scaly Ground-Roller is currently classified as Vulnerable.